University’s Law Society visited the Supreme Court of the United Kingdom for the final of its Mooting Competition. Students from Plymouth University’s Law Society have had a taste of the top, after a visit to the Supreme Court of the United Kingdom. 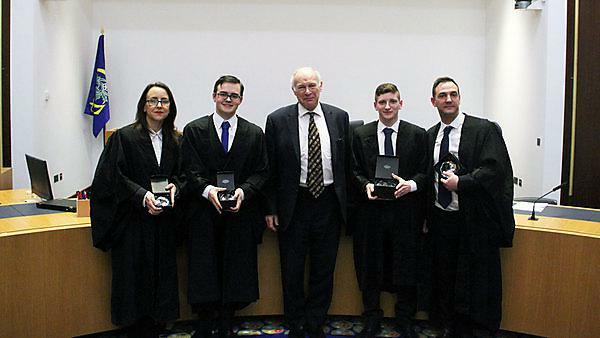 The Society made the trip to London for its Mooting Competition final on 16 March, which was judged by Lord Neuberger, President of the Supreme Court. The finalists – Samuel Castlehouse, Jacob Cunningham, Laura D’Alessandro and Stephen Gibson – argued a complex problem based on the Law of Trusts, in a close contest. Castlehouse and Cunningham were the eventual winners, but Lord Neuberger was highly complimentary of all of the competitors. Accompanied by a delegation from Plymouth Law School and the Plymouth Student Law Society, the moot finalists also visited the House of Lords to witness a debate on proposed changes to trade union legislation. The University's Chancellor, Lord Jonathan Kestenbaum, facilitated this visit. Student-led and focused on creating opportunities beyond the classroom, Plymouth Student Law Society is a vibrant hub for your social and professional activities. The society organises excellent social and networking events, and helps you take part in internal and national student competitions.